How do we teach mathematics at Fielding? At the centre of the Fielding’s mastery approach to the teaching of mathematics is the belief that all pupils have the potential to succeed. Developing a 'Mathematical Mindset' in every child enables them to proactively self-regulate and take ownership of their learning through metacognition. They should have access to the same curriculum content and, rather than being extended with new learning, they should deepen their conceptual understanding by tackling varied and challenging problems. Similarly with calculation strategies, pupils must not simply rote learn procedures but demonstrate their understanding of these procedures through the use of concrete materials and pictorial representations to ensure fluency and depth of understanding. The principle of the concrete-pictorial-abstract (CPA) approach is that for pupils to have a true understanding of a mathematical concept, they need to master all three phases. Reinforcement is achieved by going back and forth between these representations. Pupils who grasp concepts rapidly should be challenged through rich and sophisticated problems before any acceleration through new content. Those pupils who are not sufficiently fluent with earlier material should consolidate their understanding, including through additional practice, before moving on. Through the use of ‘Fielding Learning Journeys’ the children follow a visible learning approach using Solo Taxonomy* levels of progression to take ownership of their evidence based learning. The focus is on the development of deep structural knowledge connected with Big Ideas in order to make connections. Making connections in mathematics deepens knowledge of concepts and procedures, ensures what is learnt is sustained over time, and cuts down the time required to assimilate and master later concepts and techniques. At Fielding Primary School we are committed to a Mastery approach to teaching maths and we are now a working group school for the NCETM's Central and West London Maths Hub. Through this collaboration, we continue to improve our bespoke maths curriculum in order to best suit the needs of our children. We do not follow a set scheme; instead we utilise the best resources available including NCETM resources, NRICH, White Rose Maths and Power Maths. Please refer to the attached documents below for examples of our long-term curriculum maps, mid-term 'Learning Journeys' and a presentation on our approach to Mastery and teaching for greater depth. Each year group covers a number of National Curriculum objectives in each domain over the course of the school year. Please refer to the DFE's National Curriculum for KS1 and KS2 for an overview of each domain covered in each year group to help give you an idea of how to help support your child at home. Purpose: The times tables challenge has been designed to support the development of rapid recall of multiplication facts and the corresponding division facts for all pupils across KS1 and KS2. The challenge consists of 21 stages. These work progressively through multiplication facts and derived division facts, with a test at each stage to test speed and accuracy. Each stage has a tracking sheet (practise sheet) which will be taken home with home learning each week and practised. Each child will be tested once a week, on the stage they have been working on at home, in a timed test of two minutes. 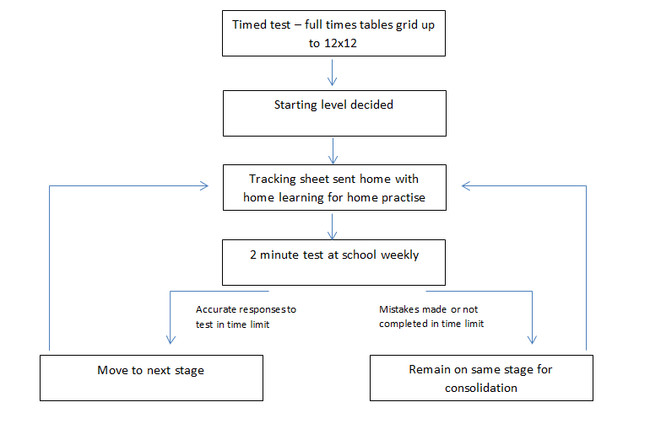 If the test is completed accurately, the child will automatically move onto the next level, taking home the tracking sheet for that level and practising at home as part of home learning. If the test is not completed accurately, or finished within the time limit, the child will remain on the same stage as the previous week and continue to practise at home – re-doing the timed test the following week. All children will have the stage they are working on recorded on a class record chart and will help the class teacher, and the child, track progress through the levels. 2017/18 Timed test Update: Initial attempts to do each level will be timed at 3minutes. Once a child has completed all the levels they return to level 8 and progress through the levels again timed at 2:30. Finally, once they have completed all the levels at this time they return to level 8 and repeat timed at 2minutes. Below is a quick-reference guide for the tracking sheets. It shows you which stage of the challenge corresponds with which multiplication facts. Use the link below to help support your child at home, using the calculation strategies and language used in school. The link will lead you to a page of videos, linked to the many different domains we cover, and will enable you to see how your child has learned to calculate answers and solve problems. An intensive programme for children not yet secure with multiplication facts up to 12 x 12. Use the guide and support in this document to help pupils with times tables skills and knowledge.